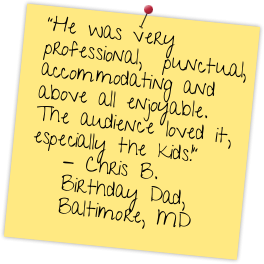 Eric Henning is a Maryland magician in the Washington, DC area who specializes in entertaining families with children ages 4+ at social, community and corporate events with his award winning magic! Fun, Powerful, Interactive Entertainment to Make Your Event Amazingly Successful! "Help! I have a family event!" Relax. Check it off your list. 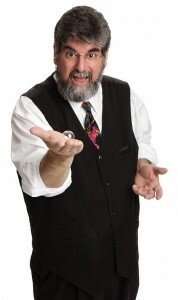 Let me help make YOUR event magically memorable! My name is Eric Henning, and for the past four decades (yes, since I was a kid myself), I have been mastering the art of entertaining families. Years ago, i was booked for many church and school events, where I was basically a highly-paid babysitter. Then I noticed something strange. During my magic show, by the second or third routine, EVERYONE was watching. I had stumbled onto a BIG SECRET of family entertainment: what I call the "Bugs Bunny Effect." The KIDS get BELLY LAUGHS at the sight gags, while the ADULTS enjoy the verbal humor, and EVERYONE marvels at the magic - just the way it should be. Everyone has a great time at my shows. Since then, I have performed for Presidents, princes and that toughest of audiences - preschoolers. Through it all, my techniques and my shows have been tested, refined and proven. Whether you are hosting a holiday party for 200 kids, a corporate picnic for 100 families, or a home birthday party for 20, put my experience to work and I GUARANTEE to help make YOUR event AMAZINGLY SUCCESSFUL! Don’t delay and call today. "Eric did an excellent job, he took the challenge of entertaining nearly 35 five- and six-year-olds and kept their full attention for 45 minutes. That alone was beyond magical and amazing!!! They laughed and laughed and enjoyed his presentation very much. As for me, I appreciated his prompt response to all my emails and he also gave me a phone call to let me know that he was coming the day of the party. He was awesome!"